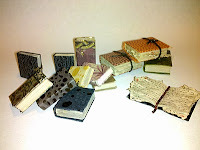 I made quite a few and even made a few open books, what do you think? All are made by me even the writing on the pages. I was thinking that back in the time of witches & wizards they would have a lot of old books that were handed down from one generation to another and with a tiny tiny brush I came up with these. Have a great mini day! I got a book from the local library on how to make books and tied my hand at making mini books. I've made booms before but with fimo clay, i even did a tutorial on the Greenleaf Forum but never paper books. I got inspired by all the cool new scrapbook paper the local scrapbook store had and thought hey I can make those... And so i did, its getting late and i have work tomorrow but i will post some pics of what i made tomorrow. Night for now. I just wanted to say a BIG hello to Kim from Kimsminiatures!!! 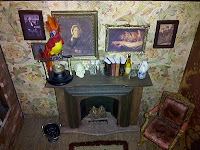 I have been following your blog for a bit and I am truly an admirer of your cakes and cookies, so very realistic. It makes me want to go home and play with fimo for the next week straight. Just another quick peek inside my shop. As you can see I'm filling it up slowly, but soon enough it should be overflowing with creatures and things. 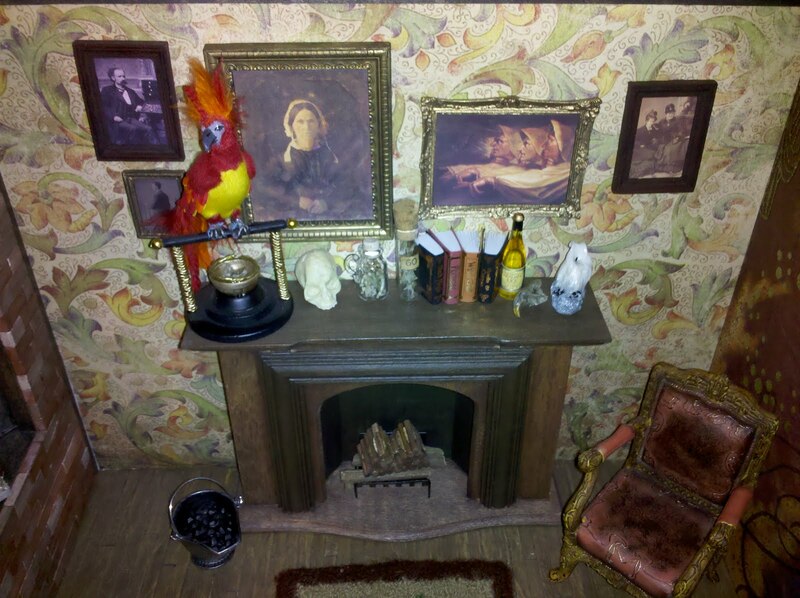 Here is another inside pic with the fireplace and the lovely Phoenix I got at a local show a while back. Here is the inside of the shop to show the wood flooring and some pictures I "hung" on the wall. This is my ongoing project which when finished will be part of my version of the shops in Diagon Alley. So far I have added bricks to the outside and inside front walls. They have been sealed and a dark wash put over them to give them and old/dirty look. The wood frame has been stained and also sealed. The inside flooring is wood from coffee stir sticks cut to size and glued down then stained and sealed. The stones on the ground are made from egg cartons and have been colored then sealed and coffee grounds are used to simulate dirt. I love everything about minis especially creating things from scratch or re-purpose things. Its funny even as a child I was always drawn to little/mini things. I remember I even had those dolls The Little Family. Hmm wonder if they would like to live in a half scale house!! !